RJD president Lalu Prasad was today granted release order by trial courts from jail in accordance with the Jharkhand High Court's verdict providing him provisional bail. 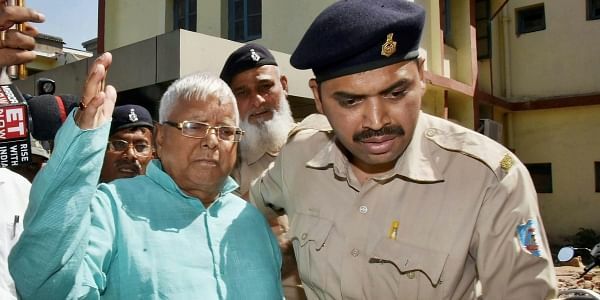 PATNA: Jailed RJD chief Lalu Prasad Yadav, who has been sentenced to several years in jail due to his conviction in four cases of the fodder scam, was on Wednesday released from Birsa Munda Central Jail in Ranchi on a 42-day bail granted on medical grounds. The 69-year-old former Bihar chief minister flew to Patna by an evening flight, accompanied by two trusted aides. Hundreds of his supporters had gathered at Patna airport to greet him, but the ailing leader spoke neither to them nor to the media due to restrictions imposed as bail conditions. The release order from jail was issued after three sets of bail bonds of Rs 50,000 each were filed for him by RJD leaders in the CBI special courts for the fodder scam cases related to the treasuries in Deoghar, Dumka and Chaibasa. Yadav was convicted in these cases between December 23, 2017 and March 19 last. He is already on bail in a previous case of this Rs 1,000-crore scam related to Chaibasa treasury, in which he was convicted in September 2013. Yadav has been sentenced to 27 years and a half in jail in these four cases. Although Jharkhand High Court granted him bail on May 11, Yadav spent the past two days in jail after returning from Patna, where he was on a three-day parole to attend his elder son Tej Pratap Yadav’s wedding. The delay was caused because of lengthy bail formalities. After the HC’s bail order reached the CBI special courts on Wednesday, judge Shiv Pal Singh sought deposit of Yadav’s passport. “The court was informed that the passport was already deposited in the court during the trial in the case RC 38A/96 related to Dumka treasury,” said Yadav’s lawyer Prabhat Kumar. As per the bail conditions, Yadav will not indulge in any political activities like holding parleys or addressing rallies. He will have to inform the court about the medical treatment he is undergoing during the bail period. The bail conditions also debar him from speaking to the media. “It is our priority to ensure effective treatment of the 16 kinds of ailments he is suffering from. An appointment will be sought soon from renowned heart surgeon Dr Ramakanta Panda of Mumbai’s Asian Heart Institute for his cardiac complications,” said senior RJD leader Bhola Yadav, who is among the party chief’s trusted aides. Lalu Prasad Yadav had undergone an open heart surgery in August 2014. “Till the time appointments with doctors in three specialised institutes are finalised, he would be under the treatment of doctors in Patna, said Bhola Yadav. The RJD chief, who also served as railway minister in the UPA-1 government, is suffering from a host of ailments including diabetes, blood pressure and kidney problems.